In one of his most extensive and revealing interview since he was elected in March 2013, Pope Francis has sent shock waves through the Roman Catholic church on Thursday with the publication of his remarks that the church had grown "obsessed" with matters such as abortion, gay marriage and contraception. 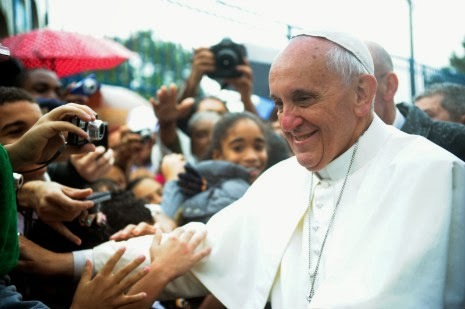 As reported by the New York Times, the Popes' surprising comments came in an interview in which it is said that he criticized the church for putting dogma before love, and for prioritizing moral doctrines over serving the poor and the marginalized. "It is not necessary to talk about these issues all the time. The dogmatic and moral teachings of the church are not all equivalent. The church's pastoral ministry cannot be obsessed with the transmission of a disjointed multitude of doctrines to be imposed insistently." "We have to find a new balance, otherwise even the moral edifice of the church is likely to fall like a house of cards, losing the freshness and fragrance of the Gospel." "I see the church as a field hospital after battle," Francis said. "It is useless to ask a seriously injured person if he has high cholesterol and about the level of his blood sugar. You have to heal his wounds. Then we can talk about everything else." "A person once asked me, in a provocative manner, if I approved of homosexuality," he told Father Spadaro. "I replied with another question: 'Tell me: when God looks at a gay person, does he endorse the existence of this person with love, or reject and condemn this person?' We must always consider the person." Asked what it means for him to "think with the church," a phrase used by the Jesuit founder St. Ignatius, Francis said it did not mean "thinking with the hierarchy of the church." "This church with which we should be thinking is the home for all, not a small chapel that can hold only a small group of selected people," he said. "We must not reduce the bosom of the universal church to a nest protecting our mediocrity." Father Spadaro is said to have conducted the interview during three meetings in the Pope's spartan quarters in Casa Santa Marta, the Vatican guesthouse where Francis said he had chosen to live because it is less isolated than the papal apartment in the Apostolic Palace. The interview, kept under wraps for weeks by the Jesuits was released simultaneously on Thursday, by 16 Jesuit journalists from around the world. I love how Pope Francis answered these questions. It's doesn't change the rules, but really, it does change the tone. Regardless of a person's preferences or orientation, we cannot deny that they are a person worthy of God's love--regardless. I also love his views on what the church is--a hospital after a battle. Healing wounds instead of trying to separate people. Hi Kalley, thank you for your comment which comes as added value to this post. For those who have been hurt by church understand too well this meaning of church that it must be about healing people with their various wounds and not the thing that hurt them in the first instance.